Martha Stewart always wows me with the best recipes in the world. It is a great recipe for Mother’s day, which is coming up in only a week! Whether you bake it for your mom or your family, either one will have a smile on their face while eating a piece of this fluffy, lemony, heavenly angel food cake. Make the cake: Preheat oven to 325 degrees, with rack in lower third of oven. Sift flour and 1/2 cup sugar into a bowl. Whisk whites with a mixer on medium speed until frothy, about 1 minute. Add lemon zest and juice, cream of tartar, vanilla, and salt; continue whisking until soft peaks form, about 2 1/2 minutes. With mixer running, gradually add remaining cup sugar. Increase speed to medium-high; continue whisking until firm, not stiff, peaks form, about 2 minutes. Sprinkle whites with 1/3 of the flour-sugar mixture. Using a rubber spatula, gently fold to combine. Sprinkle remaining flour-sugar mixture over whites in 2 additions; gently fold to combine. Transfer batter to a 10-inch angel food cake pan with legs. Gently run a knife through the center of the batter to remove any air bubbles. Bake until a tester inserted into center comes out clean, 45 to 50 minutes. Remove pan from oven, and invert onto its cooling legs (if your tube pan doesn’t have legs, invert it over the neck of a wine, or similarly shaped, bottle to cool); let cool, 1 1/2 to 2 hours. Run a knife around the inner and outer edges of cake to remove. Invert onto a serving platter. (Use a knife to separate cake from bottom of pan.) Let cool on a wire rack. Unfrosted cake can be stored in an airtight container for up to 2 days. Make the lemon cream: Prepare an ice-water bath. Whisk lemon juice, sugar, flour, and salt in a small saucepan over medium-high heat. Bring to a boil; whisk constantly for 1 minute, until it thickens. Transfer to a heatproof bowl set in ice-water bath to cool completely, stirring occasionally. Meanwhile, whisk cream and lemon zest with a mixer on medium speed until medium peaks form, about 3 minutes. Gently fold whipped cream into juice mixture in thirds. Refrigerate lemon cream, up to overnight. Make the candied lemon-peel flowers: Combine sugar and water in a large saucepan over medium-high heat, stirring until sugar dissolves. Bring to a simmer. Meanwhile, using a vegetable peeler, peel 3 lemons to create 6 long strips (at least 5 inches long and about 1/2 inch wide). Remove pith from strips using a paring knife. Cut tops and bottoms off remaining 3 lemons; cut each in half lengthwise. Remove flesh. Cut out 6 flowers from the peels using a 2-inch flower-shaped cookie cutter and remove pith; cut indentations into petals for definition. Punch a hole in the center of each flower using a 1/4-inch plain round piping tip. Add lemon-peel strips and flowers to the syrup. Gently simmer until translucent and tender, about 35 minutes. Remove peels from syrup using a slotted spoon, and transfer to a wire rack set over a parchment. Let dry slightly, about 30 minutes. Trim strips to 5-inch lengths, and roll each to form centers of flowers; fit into flower holes and let stand on wire rack until slightly dry but still sticky, about 30 minutes. Frost cake with lemon cream. Garnish with candied flowers. Serve. May 5, 2012. Tags: angel, angel food, angel food cake, cake, candied, candied lemon, candied lemon-peel, candied lemon-peel flowers, lemon, lemon angel food cake, lemon cake, lemon cream, lemon-peel, lemony, lemony angel food, lemony angel food cake, lemony cake, martha stewart, mother, mother's day, mother's day cake, mother's day lemon cake, mother's day lemony angel food cake. Cakes. What a lovely and elegant dessert! I almost tried making candied violets this year, but lost my nerve! May 6, 2012 at 12:24 am. Permalink. Haha, I didn’t have the patience to add the candied flowers anyway, so I just left them out; they tasted and looked great still! May 6, 2012 at 12:28 am. Permalink. Oh this looks good, I love angel food cake but never made my own! May 6, 2012 at 12:49 am. Permalink. Haha, I’ve never made my own either because someone told me that store-bought angel food cake is always better than homemade, but they were wrong! May 6, 2012 at 1:01 am. Permalink. May 6, 2012 at 4:24 am. Permalink. I know(: I never have to read reviews on her recipes; I’m sure they’ll turn out great! May 6, 2012 at 4:36 pm. Permalink. This looks delicious! My dad LOVES angel food cake, so this one might need to be a Father’s Day treat. Thanks for sharing! May 6, 2012 at 4:11 pm. Permalink. Aha your welcome (:. That is a great idea; my father likes angel food cake, but LOVES lemons, so I think I might do the same! Thanks for the idea! May 6, 2012 at 4:29 pm. Permalink. Wauw that is looking delicious!! I would like to try it very soon. You have a good looking blog!! ^^ Keep up the good work. And I will come back to your page soon. Following you definitely! May 6, 2012 at 2:56 pm. Permalink. Haha thanks! I tend to get busy a lot so I don’t have much time to blog, but I try to fit in a post at least once a week. Your blog is very interesting too! You have a variety of things to talk about, which gets a reader’s attention. And I know, right? The cake really is one of my favourites! May 6, 2012 at 6:41 pm. Permalink. May 7, 2012 at 2:25 pm. Permalink. Hehe thanks! I try to blog as much as i can.. Might blog another brownie recipe today! May 7, 2012 at 4:34 pm. Permalink. May 7, 2012 at 12:36 pm. Permalink. May 7, 2012 at 4:37 pm. Permalink. Thanks for the like and following my blog! 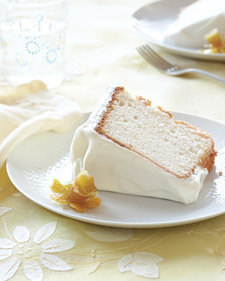 This lemon angel food cake looks delicious! I might have to try it out for Mother’s Day! May 7, 2012 at 1:47 pm. Permalink. May 7, 2012 at 4:36 pm. Permalink. May 7, 2012 at 7:43 pm. Permalink.